As Galileo satellites begin reaching orbit and transmitting their signals, a critical complement needs to be in place for the user community: Galileo-capable receivers. In the frame of Europe’s development of Galileo, the Galileo Joint Undertaking (GJU) has issued three calls since 2003 under the European Commission’s 6th Framework Program to study, design, and develop the essential technologies, components, applications, and services for the Galileo user segment. In response to the first call, Alcatel Alenia Space Italia (AASI) was selected to lead a consortium responsible for developing Galileo receiver technologies within the (GAlileo user Receiver Development Activities (GARDA) program. Within the GARDA project, AASI has developed a prototype receiver capable of processing L1, E5a/E5b, and E6 Galileo signals in addition to GPS L1. This represents one of the first GPS/Galileo receivers. In developing this prototype receiver, efforts have been made to define the architecture of the RF front-end and baseband sections to be as flexible as possible. The aim of the GARDA project was to develop a modular architecture that could be the basis for future AASI GPS/Galileo receiver products and prepare the way for user receivers to be “ready on the market” when the Galileo system becomes operational. The design flexibility also allows a quick reaction to the evolution and changes in the Galileo signal specification. In particular, the GARDA design is the basis for the on-going development of a safety-of-life (SoL) receiver within the GJU’s Galileo Integrity Receiver for Advanced Safety Of Life Equipment (GIRASOLE) project. Further, GARDA receivers are going to be used within the Galileo receiver chain of the ground mission segment sensor stations to feed data to the Galileo orbit determination, integrity and timing facilities. The GARDA project has also provided the opportunity to analyze future market of Galileo applications, to study some core receiver processing techniques and also to develop two important components such as the Galileo RF signal simulator as well as a complete Galileo receiver and environment SW simulation tool. This article will describe the design and testing of the receiver technology developed under the GARDA program. We will begin by describing the design challenges and core technologies identified as crucial for receiver development. Then we will address the receiver architecture, functions, and designs developed and tested in a prototype system before implementation in the final product. A section of the article addresses the development of two GNSS simulators as part of the GARDA initiative. These simulators were used to help in test-bench design and development of the receivers as well as in testing and performance verification, along with commercial simulators. The article will conclude with a discussion of key results from test evaluations of the GARDA receiver. Due to the new Galileo signal-in-space (SIS) structure, Galileo receivers will have to operate and process navigation signals that differ substantially from GPS C/A code by different chipping rates, introduction of pilot signal components or different signal formats, such as binary offset carrier or BOC(1,1) on in the L1 frequency band and AltBOC(15,10) on the E5a and E5b bands. Consequently, GARDA identified core technological areas considered essential for future Galileo receivers, including a subset of selected topics with respect to signal processing. Three main modules comprise the GARDA receiver architecture designed by AASI. Antenna and RF front-end . . .
RF/IF section . . .
Digital section . . . The prototype developed in the GARDA project is a full AASI design. The receiver was initially aimed at verifying the Galileo signal processing capabilities on the four Galileo RF Frequency Channels (L1, E5a, E5b, E6) with the Galileo SIS Interface Control Document (ICD) evolving from issue 7 up to issue 11. The antenna breadboard design has been driven by the following concepts: phase center stability, minimization of multi-path and overall phase error, suppression of unwanted out-of-band signals, and minimization of manufacturing costs. The design of the RF/IF section includes the hardware for two complete signal paths with identical architecture. Each path is in charge of generating the local oscillator (LO) signal, mixing the incoming RF signal to intermediate frequency, according to a properly defined frequency plan, providing the signal amplification, filtering and, finally, digitizing the IF signal. The digital signal processing board is an AASI reprogrammable computing platform for high data-throughput signal processing Galileo/GPS applications. The module can process an entire Galileo/GPS digital channel acquired via LVDS Interface. A software receiver simulator is a key element in the GARDA project. The simulator, developed and subsequently commercialized by one of the GARDA consortium members, has a dual role: test-bench for integration and evaluation of receiver technologies including integration and analysis of user defined algorithms on one side, and SW receiver as asset for GNSS application developers on the other side. Laboratory equipment design to faithfully reproduce representative GNSS signals in space provides an indispensable aid to the rapid development and effective performance verification of GNSS receivers. This is particularly true in the case of Galileo, for which space and ground segments are being concurrently developed under a tight schedule. 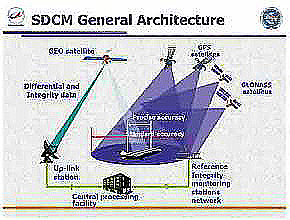 As a matter of fact, despite certain commonalties with GPS, Galileo has specific features that imply the need for an ad hoc development of user receivers. In addition to verification of the acquisition and tracking functionality performed in May 2006 with the GIOVE-A Galileo Satellite Testbed–V2 satellite, the GARDA receiver prototype has been tested using several types of laboratory test equipment. • building blocks from the GARDA design are also being re-engineered for the test user receiver that will be employed to assess the performance of Galileo during the in-orbit validation phase. Furthermore, the software simulator toolkit as well as the Galileo RF signal simulator are available to Galileo receiver and user applications and will be further improved to incorporate additional features.